and U.S. Olympic Training Center. Known as the “Grande Dame of the Rockies,” The Broadmoor has been a vacation destination of choice for presidents, diplomats, and celebrities since its opening. Top-notch amenities and service have earned the Colorado Springs getaway the longest-running Forbes Five-Star and AAA Five Diamond Awards, and continue to draw visitors from around the world. The area’s moderate climate and pristine location further elevate the experience. Encompassing 5,000 acres, The Broadmoor rests gracefully at the foot of the Rockies. Four distinct seasons offer year-round recreation, including championship golf, tennis, and more. Indoors, guests enjoy a five-star spa, fitness center, and 20 unique restaurants, cafés, and lounges, such as Play, a dining and late-night destination for bowling and global cuisine, and Restaurant 1858, a venue at Seven Falls. With 185,000 square feet of meeting space, 784 guest rooms, and an in-house AV provider, the resort hosts any type of conference or seminar. To enhance business gatherings, The Broadmoor Outfitters can design half- and full-day events — among them outdoor team-building outings such as fly-fishing, zip-lining, falconry, mountain biking, hiking, and rock climbing, all providing authentic Colorado adventures. The Broadmoor Wilderness Experience, including The Ranch at Emerald Valley, Cloud Camp, and The Broadmoor Fly Fishing Camp, blends retreats in the Colorado wilderness with the elegance and superior service on which The Broadmoor built its reputation. Another highlight: easy access. Colorado Springs Airport is just 15 minutes from the resort; Denver International Airport is just 75 minutes away. The service at the Broadmoor is absolutely why it has earned 5 starts! Everything I needed taken care of was handled efficiently and without any bother to me as I managed our large group. This venue if phenomenal. I need to hold an event here. The experience and staff were exceptional. From the guest rooms to the bar and restaurants. Just enjoyed my entire time at The Broadmoor. Wish I was able to play that fantastic golf course. Excellent property and the service is top notch. We visited the Broadmoor on June 8 - June 9, 2014 and our experience was exceptional. Although a smaller group - this program is intended to support about 25 attendees - the level of service and constant support was truly amazing. Ms. Pairitz and her team were top-notch and provided last minute support during a the initial dinner. I say this without reservation: I've planned events for over a decade and I've never been treated so well. We plan to return and will use the Broadmoor as the summer destination for this particular program. I look forward working with this venue + staff again. Unsurpassed in every way. Staff was STELLAR, food fantastic, property is amazing. I received a total of ZERO complaints from my high-end attendees at our event. Right from the beginning I had an excellent experience with the Broadmoor. Tammy Page is a delight to work with. She is professional, easy to work with, & has a huge sense of urgency. She quickly has become one of my favorite sales managers. Hotel is beautiful & my client had an excellent experience. The Broadmoor is an exceptional experience. I can't say enough about the resort itself, the conference services staff, food/beverage and the ambiance surrounding it all. We were there during the torrential rains and had to quickly change up our program - they didn't miss a beat and our event was the most successful it's ever been. Truly a gem - thank you! Beautiful, spiritual setting. Calm energy around the property with lots of outdoor activities available. Food is fantastic, service top notch! I loved the surroundings and recreation available at The Broadmoor. Beautiful, historic property. Jage Gage was extremely helpful. This property is great for large groups. I will still consider for future trips. Fantastic service, impeccable facilities. I will come to the Broadmoor personally and host a group here time and time again. The conference staff is flexible and easy to work with and communicate well with me as a planner. This property is truly five star. The guest rooms and grounds are so beautiful, you never want to leave. The rooms were beautifully decorated and the staff, service and food is impeccable. Golf is awesome! Tons of off-site activities, the best selection around. Food is excellent, customer service is fantastic. All rooms have a great view. This is a beautiful property. I thoroughly enjoyed my stay. The entire staff at this hotel is AMAZING! Beautiful property. The staff was superb! We chose the Broadmoor for our event knowing that the service and destination would rival a European destination, and that our customers would see that value in using their incentive funds towards such a fantastic and memorable location! When you partner with convention services at The Broadmoor, you really have secured an outstanding team of professionals for your program. One group I am affiliated with puts Jeremy into their contract as their manager because of how he brings to life the above and beyond experience in a personal way. A standard of excellence yes, but also, they turn your head in ways you didn't anticipate. Our group loves this property and cannot wait to return in the Spring 2012! The service levels are top notch, food and beverage is great and the meeting space is laid out well for our needs. It a wonderful place for our group to enjoy a beautiful setting and take in the content of our conference at the same time. It is also easily accessible to the Colorado Springs airport - both in flights and once on the ground it is a quick drive from the airport - or if you prefer to come in and out from Denver that is another option. This property is always a group favorite and drives attendance up for sure! We hold our spring show every year at The Broadmoor and NEVER have been disappointed with anything. Just an incredible and outstanding property all around...from the shops to the sleeping rooms to the fine restaurants...love it and so do our attendees. An overall positive experience, from my guest room to the amenities, everything was wonderful. Fabulous property with beautiful rooms, great amenities, excellent service and wonderful views! The new conference space is not functional for smaller groups. The restaurant over by the new convention space is too tiny for the vast size of the space. The restaurant should be expanded to accommodate more people thus providing an option for a place to have breakfast and lunch without utilizing another section of the ballroom or the outside patio. Quality and taste of food is poor compared to other properties. Selection of themed breaks and overall selection of food needs to be expanded. Overall the service, amenities & location is phenemonal. My overall experience was great and Elite Meetings gave us a wonderful event, which was further made great by The Broadmoor. One thing that may be a small issue to most people, but is recognized by a meeting professional is that when I arrived on Sunday when I got off the elevator on the third floor, there was a trash receptacle for small items that someone had stuffed a grocery store bag of trash in to and throughout my entire stay until Tuesday afternoon, no one emptied that trash. Unfortunately, it was evident every time we got on and off the elevator and I kept waiting for someone to empty it. That is something that I would never have expected at the Broadmoor. Otherwise, all was great. Exquisite property, professional and friendly staff, superb service. The Broadmoor is a legendary property that doesn't just sit on it's laurels...the staff at The Broadmoor is amazing, working tirelessly to ensure every guest has a Five Star/Five Diaimond experience. I have been to The Broadmoor numerous times for different programs and events, as well as having hosted two events there, and they never disappoint. Attended as a guest to an conference advisory board member and was throroughly impressed by the consistent level of service, noting that the conference member felt he and I were both treated with the same level of service, with or without the badge. Lovely property, great surroundings, great meeting space and rooms! Absolutely gorgeous property with lots of activities. The Broadmoor is a gem. The grounds are beautiful and pristine. It is very large so allow for lots of walking time. Guest rooms spacious and fresh. The ballrooms are very nice and I believe all have natural light. The staff, all staff are friendly and and greet you at every opportunity. Don't Miss The Golden Bee pub for a night of songs and fun. I had an executive retreat at this property in 2005. The President and CEO, our General Manager and several other VP's attended. They were happy with the service they received, from the time they arrived until the time they departed - Excellent location to have a meeting!! Wonderful property with a wide range of options for accommodations and dining. Great food. Outdoor fire pits and ambiance are totally relaxing. Some of the best golf in the country. Access to world class fly fishing. “Our Partnership Retreat at the Broadmoor was so successful, the decision to re-book was made while we were still on-site. Attendees loved the surroundings and excellent service, and I enjoyed the fact that the entire planning process was so efficient. Colorado Springs, CO—The Broadmoor, the Five-Star, Five-Diamond resort in Colorado Springs, Colorado, announced today the opening of Cloud Camp, a wilderness retreat to be located on Cheyenne Mountain in September 2014. Cloud Camp, at an elevation of 9,200 feet, overlooks The Broadmoor and the plains to the east, Pikes Peak to the north and the Colorado Rockies to the west. A scenic 25-minute drive from The Broadmoor, the site is currently under development and consists of an 8,000 square foot Main Lodge and eleven guest cabins. The Main Lodge features a Great Room for guest congregation, with a dining area, bar and two stone fireplaces, along with an expansive timber wrap-around deck offering picturesque mountain views. Seven guest accommodations are located in the Main Lodge, including a luxurious Honeymoon Suite perched on a rock outcropping adjacent to the Main Lodge building. Interiors are rustic, yet elegant. The eleven cabins are a short walk from the Main Lodge, with beautiful views of Pikes Peak and Pike National Forest. Each cabin features private porches with swings, rocking chairs and hand-crafted wood railings, with some cabins offering a loft space or two bedrooms. To arrive at Cloud Camp, guests have the option to be transported by Jeep or mule, or enjoy a scenic 2-hour hike. Cloud Camp activities include hiking, nature walks, archery, arts and crafts, cookouts and other culinary events. For more information on Cloud Camp, please call 866.837.9520. Colorado Springs, CO—February 10, 2014— The Broadmoor is proud to announce that the property has been named “#1 Golf Resort in North America” by Golf magazine readers. With more than 8,000 readers voting on four criteria, including Golf, Lodging, Food & Drink, and Service, The Broadmoor secured a the #1 position, with readers sighting impressive property-wide renovations, as well as ranking The Broadmoor as the leader in the Service, Lodging, and Food & Drink categories. The award follows an impressive year of national recognition for The Broadmoor’s golf program. Last year Links magazine named The Broadmoor one of the “25 Best Golf Resorts in the World;” The Broadmoor was recognized by Colorado Avid Golfer “Reader and Editor’s Choice Awards” with multiple awards including “Best Resort Course,” “Best Service,” and “Best Course Conditions.” In 2014 The Broadmoor was also named one of the “Global Ten” resort golf operations in the world in Gary Galyean’s Golf Letter and received a Platinum Award from AGM (Associated Golf Merchandisers). The Broadmoor has three distinct courses, the East Course, West Course, and Mountain Course. The Broadmoor’s championship East and West courses, designed by Donald Ross and Robert Trent Jones Sr., offer scenic and challenging play for golfers of all handicaps. The East Course is known for its wide, tree-lined fairways and expansive greens, while the West Course offers rolling fairways and steeply-angled greens. The Mountain Course by Nicklaus Design adds an additional 18 challenging holes, large greens and captivating mountain views, ideal for a range of skill levels. The Golf Club also features a full-service Pro Shop, summer caddie program and electric carts and to date, The Broadmoor has hosted seven USGA championships. In addition to golf, The Broadmoor is home to 19 on-property dining options, including the Five-Star Five-Diamond Penrose Room, the award-winning Spa at The Broadmoor, and tennis. Indoor activities include Play at The Broadmoor, with six lanes of bowling, while outdoor adventures comprise of horseback riding, hiking, fly fishing, and more. For more information on Golf at The Broadmoor, please visit The Broadmoor or call 866.837.9520. Colorado Springs, CO—January 8, 2014— The Broadmoor announces the launch of its free resort app on January 6th, designed to expand its impeccable guest services and provide users with effortless resources that further enhance The Broadmoor experience. Available for iOS (phone and tablet) and Android users, and downloaded via Apple App Store or Google Play, The Broadmoor App allows current and future guests to explore award-winning dining options; on-property events, activities, and amenities; local attractions, and more. Users of The Broadmoor App will also receive special offers and promotions directly to their mobile device. Colorado Springs, Colorado— President and CEO of The Broadmoor, Steve Bartolin, announced today that as of January 2014, The Broadmoor’s Vice President of Marketing, Dennis Lesko, will retire from his position and John Rovie, currently The Broadmoor’s Director of Sales, will assume the role. Pepper Dombroski will replace Mr. Rovie as Director of Sales. Dennis Lesko, who has been with The Broadmoor for over 11 years, built a successful marketing platform for the Five-Star, Five-Diamond resort rooted in The Broadmoor’s exceptional guest service standards. John Rovie, who joined The Broadmoor in 2010, will now guide The Broadmoor’s marketing department, overseeing The Broadmoor, as well as the brand’s growing number of wilderness experiences, including The Ranch at Emerald Valley and the forthcoming Cloud Camp. Mr. Rovie came to The Broadmoor after serving five years as the Director of Sales for the Arizona Biltmore in Phoenix. After attending Arizona State University, Mr. Rovie began his hospitality career with Westin Hotels & Resorts, first at the Westin Hotel in Vail, Colorado, where he held the positions of director of banquets, front office manager, and food and beverage manager, followed by several years at the Westin Hotel, Seattle, as Director of Catering and Assistant Director of Food and Beverage. In 1993, he returned to Arizona as the director of catering for the Fairmont Scottsdale Princess. In 1995, Mr. Rovie was named the Fairmont’s National Sales Manager, then Senior Sales Manager, and then Director of Group Sales before moving to the director of sales position at the Biltmore in 2005. Ms. Pepper Dombroski comes to The Broadmoor from the Grand Wailea in Maui, Hawaii, where she has held the position of Director of Sales since 2005. Before relocating to Hawaii, Dombroski held several positions within the Rocky Mountain region, including Director of Sales & Marketing for the Snake River Lodge & Spa, in Jackson Hole, Wyoming, as General Manager of the Jackson Hole Athletic Club, and as Sales Manager for the Westin Vail Cascade Club. Colorado Springs, Colorado (October 22, 2013) - President and CEO of The Broadmoor, Steve Bartolin, announced today that Jack Damioli is joining the team this coming January in the newly created position of Vice President and Managing Director. Mr. Damioli will report directly to Mr. Bartolin and will oversee The Broadmoor’s sales, marketing and conferences, human resources, food and beverage, engineering, golf, retail and loss prevention departments. All other departments, including the Pikes Peak Cog Railway and new developments at The Ranch at Emerald Valley, and Cloud Camp will continue to report directly to Mr. Bartolin. Mr. Damioli comes to The Broadmoor from Gasparilla Inn and Golf Club in Boca Grande, Florida, where he has held the position of President and General Manager for the past seven years. Prior to that, Mr. Damioli served 22 years at The Greenbrier, working in various departments and managerial capacities including golf, front desk, conference services, resident manager, director of operations and six years as general manager. Colorado Springs, CO—The Broadmoor announced today the details of the second and final phase of renovations in its $100 million, multi-year renovation and expansion project, which begins November, 2013 to be completed May 2014. Focusing on the extensive renovation and enhancement of the original Broadmoor West building, the second phase of renovations includes the addition of a new Adam D. Tihany designed Italian restaurant, renovated and expanded guest rooms, and a new health-inspired restaurant. Maintaining the Five Star, Five Diamond resort’s standards for impeccable service and unrivaled amenities for which it is known, the new Broadmoor West elevates the overall guest experience, further strengthening The Broadmoor’s position as one of the country’s leading hotels. Reflecting The Broadmoor’s signature style of marrying luxury with comfort, Broadmoor West renovations include the extensive redesign and expansion of guest rooms with an additional 85 to 200 square feet added per room, living rooms featuring new decorative lighting, chandeliers, furnishings, carpet, and draperies, as well as all-new, five-fixture marble baths added to each bathroom. A three-story addition to the original West building adds thirty-one guest rooms and suites, bringing The Broadmoor’s total guest room count to 775. Four new suites feature panoramic views of the sprawling property, Cheyenne Lake, and the gorgeous Cheyenne Mountain backdrop. Expanding The Broadmoor’s unparalleled culinary program, Broadmoor West welcomes a brand new Adam D. Tihany designed Italian restaurant, Ristorante del Lago. Situated on the picturesque western edge of Cheyenne Lake, the new dining destination offers a traditional Mediterranean villa appearance to complement a menu of Italian regional cuisine and a robust Italian dominated wine list. The restaurant features an outdoor patio offering spectacular lake views, a private dining room, an expansive “community” dining table, a wine room, charcuterie and cheese cellars, and an exhibition kitchen with a wood burning oven and Rotissiere. Bar Del Lago, also an Adam D. Tihany design, will be expanded and updated with a traditional Italian appearance to include custom millwork, additional outdoor seating, indoor and outdoor fireplaces, and vintage wine and liquor displays. A lakeside entry will be added to both Risorante del Lago and Bar Del Lago, as well as an internal connection between the two. Play, The Broadmoor’s unique, retro-inspired restaurant and activity center located on the lobby level of Broadmoor West, remains open during the renovations. With the re-imagining of Broadmoor West, comes The Broadmoor’s latest café dining option, Natural Epicurean. A philosophy of natural, wholesome, and local cuisine to fuel the body and mind defines the space which will feature a terrace with adjacent produce and herb garden from which ingredients will be harvested. Inside, large windows, wood flooring, and an exhibition kitchen will make this an ideal place to gather for an inspired meal. Staying true to The Broadmoor’s grandeur, the Broadmoor West lobby is updated with an expanded concierge and front desk area, fresh décor, and interior design, giving it a more refined and elegant appearance. Magnificent stained glass skylights, marble floors with custom stone insets, finely detailed millwork on the walls and ceilings, woven rugs, and custom decorative chandeliers are added to harmonize the look of the space with the rest of the property’s interior facade. The entry drive and porte-cochere of Broadmoor West is transformed with custom cast bronze column caps, cast stone balustrade, a new entry fountain, stone flooring, ornate iron work, and a new decorative drive surface and complementary landscaping. “With the success of our first phase of renovations at The Broadmoor and many months of planning for our second phase, we are looking forward to this final transformation. Our enhancement to Broadmoor West will complement the surrounding property as well as enhance guest experience,” says Steve Bartolin, President of The Broadmoor. Over the next year, The Broadmoor will continue to announce further news surrounding The Broadmoor’s Ranch at Emerald Valley, the opening of Ristorante del Lago, and details on the newest addition to The Broadmoor Wilderness Experience, Cloud Camp, opening late summer of 2014. Opened in 1918, The Broadmoor is situated at the gateway to the Colorado Rocky Mountains in Colorado Springs. The Forbes Five Star, AAA Five Diamond resort encompasses 3,000 acres with three championship golf courses and 744 lodging rooms and suites. Amenities include an award-winning spa and fitness center, nationally recognized tennis program, 26 retail boutiques and 19 restaurants, cafés and lounges including new distinct concept, PLAY at The Broadmoor, as well as renovated Golden Bee and Tavern. In August 2013, The Broadmoor opened The Ranch at Emerald Valley, an intimate retreat offering refined rustic luxury in the heart of Pike National Forest. In May 2014, the resort opens a scenic wilderness retreat, Cloud Camp, on Cheyenne Mountain, 3,000 feet above The Broadmoor. Colorado Springs, CO—The Five Star, Five Diamond, Colorado Springs resort, The Broadmoor, announces an exclusive fifty year lease with a privately owned hunting and sporting ranch in Northern Colorado. Offered exclusively through The Broadmoor, groups can book a four day / three night private hunting and sporting expedition to the ranch’s premier shooting grounds, seasonally, October 2013 through March 2014. Offered only as a four day / three night experience, the all-inclusive package includes accommodations for groups of up to twelve guests in the ranch’s spectacular lodge, orientation and training with the ranch’s expert hunting guides, daily hunting excursions, and gourmet meals featuring ranch-grown beef, estate-bottled wines, and other culinary delights. The ranch is home to an abundance of wildlife amid a tranquil and scenic backdrop of trees, streams, and lakes. Considered to be one of the leading shooting locations in the west, the ranch is located on three large reservoirs, providing the perfect venue for hunting upland birds, migratory bird, and waterfowl, as well as serving as the ideal setting for team building and camaraderie. Designed in the tradition of the rustic American West with wooden log walls and decorated in Native American art, the ranch’s lodge offers spacious accommodations for guests featuring large fireplaces and guestrooms. The opening day of the four day retreat commences with a property orientation and informational luncheon at the lodge, followed by target practice and a gun safety discussion session. The first evening concludes with a reception and cookout. The second and third days at the ranch begin with a hearty breakfast served in the Lodge, followed by all-day bird hunting excursions on the ranch’s expansive property. Guests enjoy a midday break, with a gourmet picnic lunch served in the field. Each evening ends with a reception and dinner at the lodge, during which groups may pursue business matters and discussions in the ranch’s accommodating meetings facilities. On the final day, guests may partake in an optional bird hunt before an afternoon departure. A variety of additional sporting and team building activities may be pre-arranged throughout the retreat as well, with options for fishing, golfing, and hiking. The ranch’s stream and ponds boast several trout varieties and bass, with fishing equipment available for use at the lodge. The property also features a nine-hole golf course, with clubs and equipment available for guest use. Hiking and walking tours through the picturesque mountains can be arranged with the ranch’s knowledgeable guides. The four day / three night group hunting packages are available Sunday through Wednesday, October 1, 2013 through March 1, 2014 for $30,000 for twelve guests or for smaller groups, $1,000 per person, per day, with a minimum three night stay. Pricing is inclusive of accommodations, meals, and hunting, and exclusive of alcohol, shells, and targets. To book a group retreat or for more information, please contact Mike Johnson, Ranch Manager, at 970.353.1780. Additional details can be found at www.broadmoor.com/group-activities. Colorado Springs, CO—AUGUST 1, 2013— After much anticipation, The Broadmoor’s Ranch at Emerald Valley opened its doors today in Pike National Forest. Offering refined rustic luxury, approximately 8 miles west of The Broadmoor, tucked into the mountains at an elevation of more than 8,000 feet, the intimate, all-inclusive ranch features a Lodge with dining room, bar, and wraparound deck highlighting spectacular views of the lake and mountains, as well as two lakeside hot tubs, and wood-burning fire pit. The retreat features 10 cabins, sleeping a total of 32 guests, each lovingly renovated in mountain cabin style, enhanced by wood burning fireplaces, private decks, coffee and tea bar, oversize showers, and Elite Therapeutic bath amenities. Each cabin offers a unique floor plan, from the cozy Aspen cabin which sleeps two to the spacious Hill Cabin, sleeping up to ten, complete with a chef’s kitchen, spacious deck and private fire pit, perfect for an extended family or group of friends. Broadmoor chef-prepared meals are served in the gracious Lodge, around a large stone hearth. Twice weekly, The Ranch offers gourmet cookouts with fresh grilled fish, juicy steaks, and traditional accompaniments, along with house-made desserts such as strawberry and cherry pie. A wide variety of refreshments complements the cuisine, including fine wines, local microbrews, and a selection of spirits. Guests of The Ranch at Emerald Valley enjoy access to the wilderness area of Pike National Forest, ideal for mountain biking, nature hikes, canoeing, lawn games, and stargazing. The Ranch’s primary activities include fly fishing on a private lake and horseback riding through nearby mountain valleys, meadows and trails, with a concierge on-hand to assist with all arrangements. Distinctive to The Ranch at Emerald Valley is the unparalleled guest access to the amenities at The Broadmoor. With just a phone call, guests of The Ranch may enjoy all The Broadmoor has to offer, including swimming pools, fitness center, championship golf, shopping, Five Star spa and distinctive dining options. Additional costs may apply. “People visit Colorado to experience its simple beauty, tranquil lifestyle, and pristine wilderness. The Ranch at Emerald Valley offers not only this unique experience, but the impeccable service and luxurious comforts The Broadmoor is known for,” says Steve Bartolin, President and CEO of The Broadmoor. For the 2013 season The Ranch at Emerald Valley opens August 1st and closes at the end of October, reopening for the 2014 season on June 1st. Rates begin at $500.00 per adult, based on double occupancy, inclusive of accommodations, activities, meals, and non-alcoholic refreshments. visit www.broadmoor.com/Ranch-Emerald-Valley or call 800.755.5088. Colorado Springs, CO—May 30, 2012—The Broadmoor announced today a $60 million renovation over the next two years, strengthening its position as one of the preeminent resorts in America. The multi-phase renovation includes the expansion and redesign of guestrooms and suites and extensive updates to food and beverage outlets and meetings, events and activity facilities, which, added to the service-oriented reputation of The Broadmoor, elevates the overall guest experience. "After many months of planning, we are extremely pleased to embark on this multi-faceted renovation. The designs perfectly complement The Broadmoor’s classic ambiance, refinement and original grandeur," said Steve Bartolin, President, The Broadmoor. In May 2012, the first phase of renovations was completed. This included the re-opening of the Southlake building guestrooms and suites and a new look for Cheyenne Lodge, one of The Broadmoor’s premier meeting and event facilities. The Southlake building now boasts a new exterior and landscaping, new entry vestibules, 16 new patios and 21 newly renovated rooms, of which 8 are suites. The Broadmoor’s 6,300 square-foot Cheyenne Lodge, offering both indoor and outdoor conference and event space with views overlooking the mountains and Colorado Springs, has a new look that features a handsome, rustic exterior with timbers and split logs, capturing the essence of a true Colorado lodge. Originally designed as a “rest” chapel by Julie Penrose in 1918, the historic Pauline Chapel, located across from Broadmoor West, has been carefully restored. Non-denominational services are held every Sunday. The chapel is also available for weddings. • TAVERN GARDEN ROOM: The Tavern’s Garden Room will be rebuilt to give it a European conservatory feel with an abundance of florals added to the plant life. The Tavern will remain open for dining during this renovation. • GOLDEN BEE: The popular dining destination and watering hole for locals and guests alike will be expanded, almost doubling in size and will debut a new façade and covered rooftop, reminiscent of a 19th century London pub. • ACTIVITY CENTER: The Broadmoor is adding an activity center in Broadmoor West featuring bowling lanes, billiards, board games, food and beverage offerings and more. The activity center is designed to appeal to families, teens and individuals, as well as special events and private group functions. • WEST LOBBY BAR: The West Lobby Bar will be redesigned and expanded to include a living room with a fireplace and an expansive outdoor terrace. • NEW ITALIAN RESTAURANT: To further complement the diversity of dining options at The Broadmoor, the restaurant will open with décor reminiscent of a historic Italian villa and a menu focused on authentic ingredients sourced from Italy. • BROADMOOR WEST: Expansion of rooms, baths and lobbies and redesign of the building exterior will give West the character and charm reminiscent of the historic main building. All rooms will feature five fixture marble baths with combination of terrace, balconies, French doors and Juliet balconies. 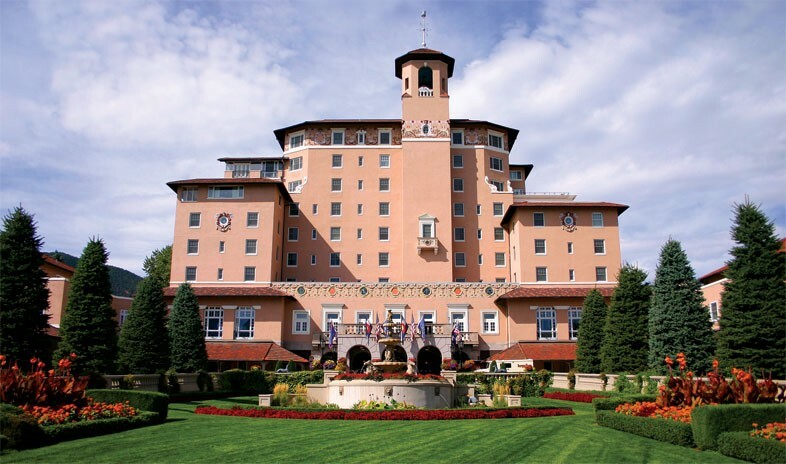 Opened in 1918, The Broadmoor is situated at the gateway to the Colorado Rocky Mountains in Colorado Springs. The resort encompasses 3,000 acres with three championship golf courses, 744 lodging rooms and suites, including the new Cottage suites. Amenities include an award-winning spa and fitness center, nationally recognized tennis program, 25 retail boutiques and 18 restaurants, cafes and lounges. The BROADMOOR is a member of Preferred Hotels and Resorts and Historic Hotels of America. NOTE: Photos and renderings are available at FTP://mail.broadmoor.com in the file called 2012-13 RENOVATIONS PHOTOS-RENDERINGS. No password is needed. Colorado Springs, Colorado (March 19, 2010)...It is not a surprise. The downturn in the economic climate has put most hotel construction and renovation in a deep freeze. Few properties are moving forward with capital expenditures geared at improving the overall guest experience and enhancing meeting space. However, that is not the case at The Broadmoor. Work began in December, 2009 on three projects totaling $7.5 million that are directly aimed at future guest and meeting experiences, and they are all taking place in Broadmoor West and West Tower. The WestTower opened in 1995. The building highlights some of the best mountain, lake and golf course views on the property. The 148 rooms and suites of West Tower now feature all new FF&E (furniture, fixtures and equipment) including carpet, wall covering, draperies, fabrics, paint, artwork, new higher end furnishings, new bright work, televisions and shower assist bars in the baths. The exquisite Gaylord Suite sports all new custom furnishings, carpet, draperies and bedding, in addition to a new dining room area and beautifully appointed furniture and planters on its expansive outdoor deck. Originally opened in 1976 and completely renovated and expanded in 2000, Broadmoor West will also sport a new look including new carpet, paint and furnishings for the all lobby areas as well as the popular West Lobby Bar. In addition, the Lobby Bar's outdoor seating is being expanded with new furnishings and outdoor heaters. Designed to enhance a Broadmoor meeting experience, the newly renovated West meeting rooms feature high quality dÃ©cor, technological capability and diverse functionality with the addition of four new meeting / conference rooms that include a new pre-function area with a custom designed and beautifully appointed break area. All existing meeting rooms are redone to include new ceiling mounted video projectors and drop down video screens. The public areas, corridors and restrooms are completely renovated and all meeting space in Broadmoor West have new ceilings, lighting, wall covering, carpet, mill work and trim. The Broadmoor is the longest-running consecutive winner of both the AAA Five-Diamond and the Forbes/Mobil Travel Guide Five-Star awards.